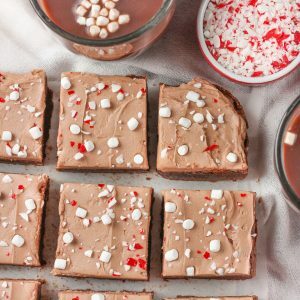 Rich, fudgy one bowl brownies are stuffed with peppermint and marshmallows and topped with a fluffy hot chocolate buttercream to make up these easy Peppermint Hot Chocolate Brownies! I promised at the beginning of the week that I would finally share some wintery, holiday flavors with you! When I think of the flavors of Christmastime, the first one that always comes to mind is chocolate peppermint. And not just a “mint” flavor, it has to be peppermint. Peppermint hot chocolate is one drink that I have to have every year. Preferably while relaxing, wrapped up in a blanket, and watching the snow fall! While we’ve already had snow a few times, it’s currently sunny and in the 40’s with no snow in sight. 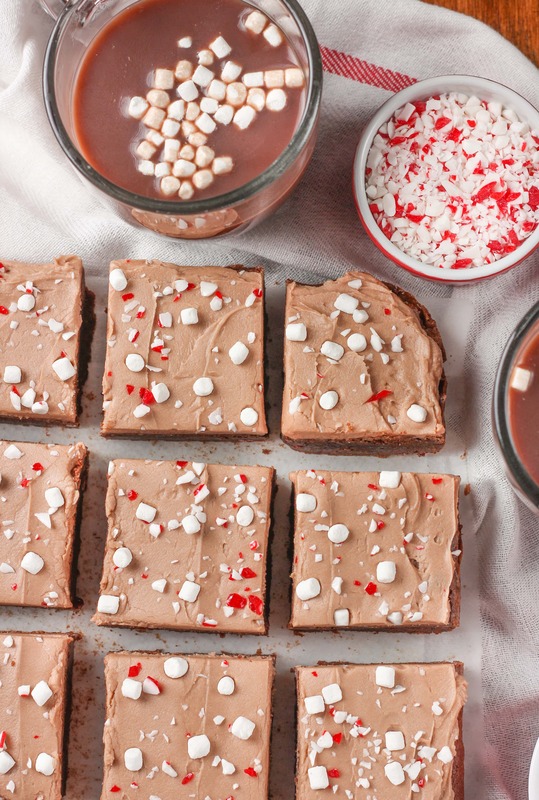 So, instead of drinking peppermint hot chocolate, I thought I would go for the next best thing…peppermint hot chocolate brownies! The base of these brownies is from my one bowl s’mores brownies. 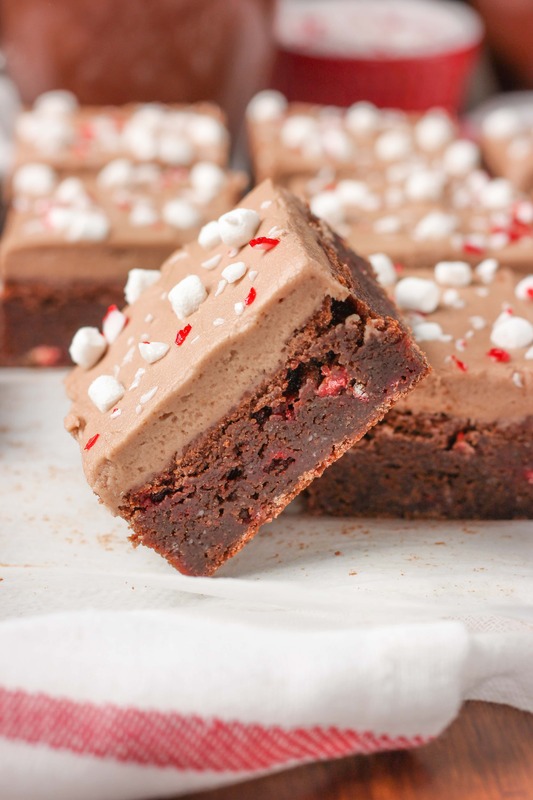 Rich and fudgy, these brownies are the perfect base to add in peppermint baking chips and marshmallow bits! 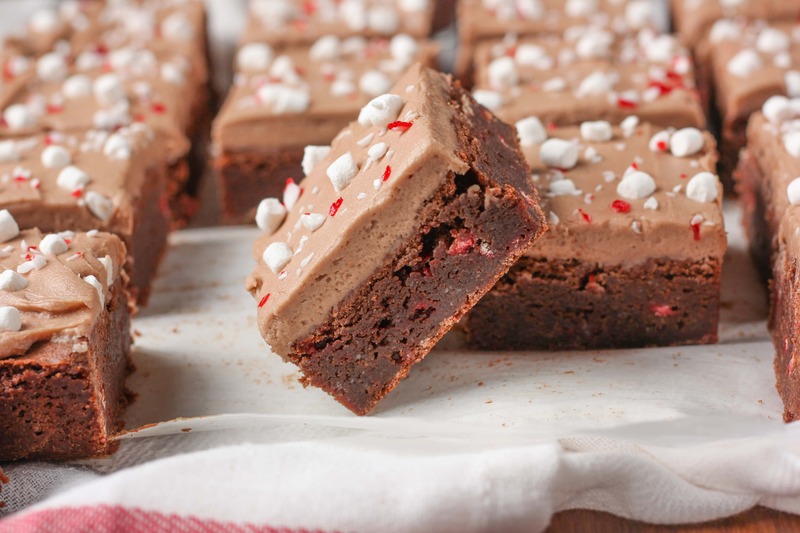 While I prefer using crushed peppermints most of the time, I ended up using Andes Peppermint Crunch baking chips in these brownies. They do a better job of holding their shape and staying soft, so you don’t have to crunch through every bite of your brownie. Though I did stick with a sprinkling of crushed peppermint on top! 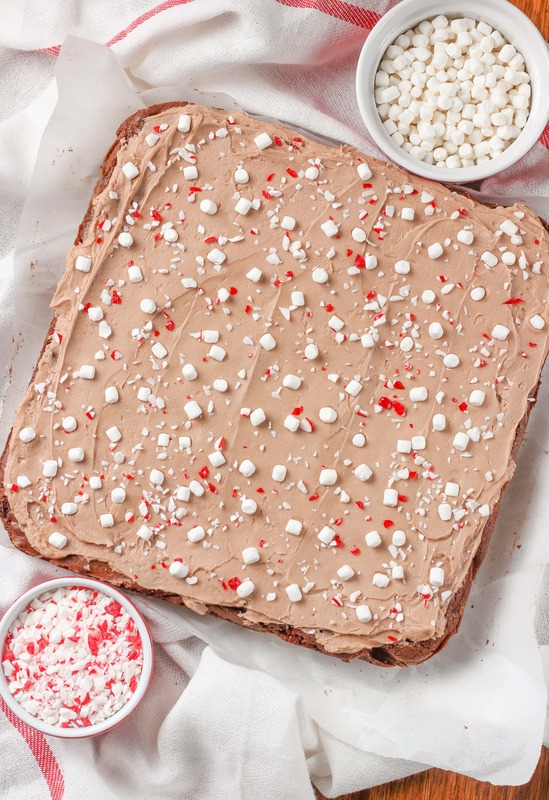 A fluffy hot chocolate buttercream gives you a bit of that classic hot chocolate flavor that you expect when you think of hot chocolate and ties together the brownies with the marshmallows and peppermint. Cut yourself a big piece, and take some time to relax and enjoy the season! Preheat oven to 375. Line a 9x9 inch (or 9x13 inch**) baking dish with parchment paper or spray with non-stick cooking spray. In a large microwave safe bowl, melt butter in microwave. Add chocolate chips to melted butter and let sit for a minute. Stir in chocolate chips until smooth. Stir in sugar. Beat in eggs and vanilla until creamy. Stir in flour and salt until combined. Stir in Andes baking chips/crushed peppermints and marshmallow bits. Spread into prepared baking dish and bake for 30-35 minutes, or until toothpick inserted in center comes out with just a few crumbs. In the bowl of a stand mixer, or a large bowl if using an electric mixer, whisk together hot chocolate mix and hot water until mix is dissolved. Beat in 1 cup confectioner's sugar until smooth. Add in remaining 1 cup confectioner's sugar, butter, and vanilla extract. Beat until creamy. Spread frosting over cooled brownies. Sprinkle with marshmallow bits and crushed peppermint, if desired. **If using a 9x13 inch baking dish, start checking the brownies at 25 minutes. You may also want to make a double batch of the frosting, as the frosting makes a thin layer for a 9x9 inch baking dish. I was looking for an idea to make a dessert that would include chocolate and peppermint this Christmas and it seems that my search has just ended. Thank you so much !